In the East Bay, Venezuelans keep the holiday tradition alive to connect to their heritage. 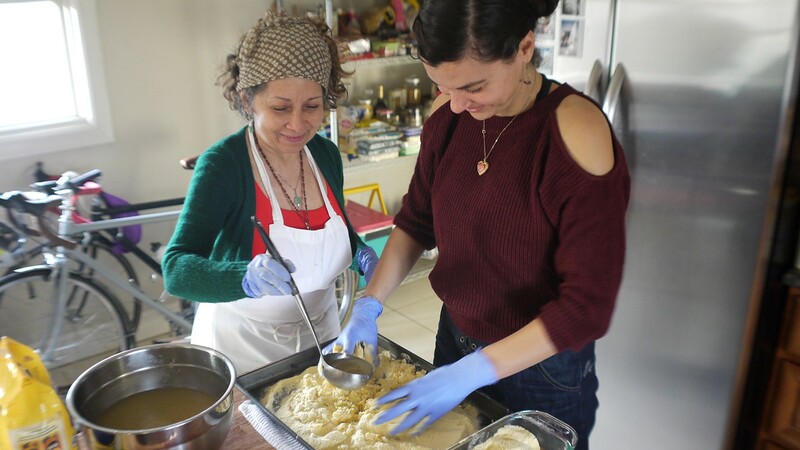 Maria Leon (right) made hallacas in Oakland when her mom visited from Venezuela. Just like every Venezuelan, I grew up making hallacas every December. Similar to Mexican tamales, hallacas are a traditional Venezuelan dish eaten around the holidays. Corn dough is stuffed with guiso, a stew made out of beef, pork, and hen, plus a number of garnishes like pickled vegetables, olives, raisins, onions, and others depending on the region. Then, the hallacas are wrapped in smoked banana leaves and boiled over firewood. Growing up, my family drove across the country for 16 hours to the Andes to see my grandma and make hallacas. Aunts, uncles, cousins, and neighbors got together to dedicate an entire weekend to the tradition. We hosted friends to the sound of gaitas (Venezuelan Christmas music) and drank rum and eggnog. We'd also make a big pot of chicken soup with hearty root vegetables for people to eat while they worked. But things are different now. According to The Guardian, Venezuela's inflation is comparable to Germany's World War crisis and Zimbabwe's hyperinflation of 2008. Reuters reports that the official minimum wage of the country is $1.61 per month, yet a box of powdered milk, according to Business Insider, can cost $700. People struggle to find the most basic of food products. Needless to say, the average person can no longer afford to make hallacas every holiday season. How can people keep traditions alive amid hardship? Ingrid Leon, a Venezuelan living in Walnut Creek, said that the hallaca used to be a symbol of Venezuela's former bonanza, back when the economy gave residents access to products from abroad such as paprika and olive oil. The economic downturn that has ravaged the country for the past eight years has affected every Venezuelan. "When I talk to my mom or my brothers at home, they say that having a hallaca is a luxury. It's no longer a tradition achievable by all, so there's envy and shame," Leon said. "When the holidays come, many people cannot afford to eat hallacas. Some might be considered lucky to have one to share one with an entire family." For Venezuelans living in the East Bay, however, the local bounty means they can preserve the hallaca tradition here. Kareen Santiago, a radio producer in San Leandro, felt proud when she made hallacas on her own for the first time. She said that despite the arduous work, she was glad that her son could stay connected to his Venezuelan roots. Kiko Rodriguez, the Venezuelan chef of Federico's Grill in Fremont, makes hallacas with his family every year. ("Christmas wouldn't be Christmas without them," he said.) He thinks it's important to understand and honor the tradition because "the hallaca is a perfect representation of the multicultural Venezuelan heritage." The word "hallaca" means "package" in the indigenous Tupi-Guarani languages. The tradition started with Spanish landowners who would throw opulent banquets and chuck the leftovers, even though they consisted of meat and other delicacies. Indigenous landworkers and African slaves would then make meals — like hallacas — out of the food scraps. Cultural traditions are an important way to connect with our history and create strong bonds with our families and communities. It's for that exact reason that Carolina Abolio, owner of Oakland arepa purveyor Miss Arepita, doesn't want her business to serve hallacas. "Making hallacas is a lot of work, but it's also a great, big party with family and friends," she said. "To me, hallacas is like chicken soup, like being home." Doris Farias de Pulgar thinks otherwise. She earned a living selling hallacas in Venezuela before moving to San Jose three years ago. She chokes up when she talks about the family and friends who cannot afford to buy olives or raisins for hallacas back home. Even for herself, it was becoming increasingly difficult to make money off of hallacas in Venezuela because the cost of ingredients rose daily. By the time she was ready to deliver an order, she needed to charge four times as much just to cover costs. She was surprised to find it's financially easier to make hallacas in the Bay Area than in Venezuela, so she decided to start her own small business. When her vegetarian daughter wanted hallacas for Christmas, Faris de Pulgar recognized the potential to earn a profit off of hallacas here, especially amongst vegetarian or gluten-free eaters. Now, she uses the profits from her business to help people back home. She and her daughter ship ingredients and send as much money as possible to as many people as they can, especially around the holidays. Venezuelans in the East Bay agree that throwing a party to make hallacas is a great way to connect with family, childhood memories, and our home country, but there's still debate about what matters most. For Rodriguez, the guiso is clearly essential, but Abolio says the key is the presentation. ("The hallaca is an elaborate art piece that you put together and enjoy eating later," she said.) Others say the most important ingredient is love. Even if you are using vegetables instead of meat — or whatever few ingredients Venezuelans can find back home — people will be able to taste the difference when you put your heart into it. What matters most, however, is not one particular ingredient but the ability to celebrate Venezuelan history by making them at all, whether at home or abroad. More diversity in roles, staff, and stories are all needed, say local filmmakers.